This article applies to upgrading Customer Service from CPM versions 6.3 SP2 and prior. 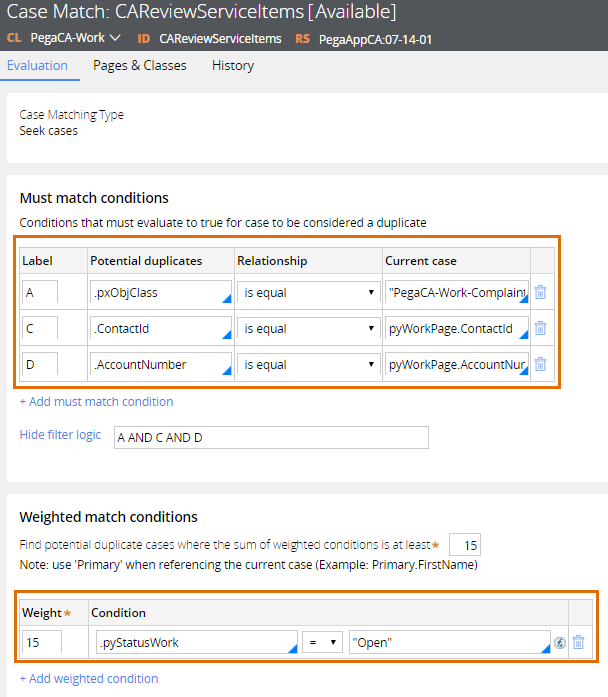 Starting in the Pega 7 Platform, the Case Match rule form has been updated. To update existing case match rules in Pega Customer Service, upgrade existing case match rules in the implementation application. Identify the class group name for which you want to process case match evaluation. Copy the CAReviewServiceItems case match rule from PegaCA-Work to an implementation layer class group. Configure the CPMLoadServiceCaseGroups extension data transform to include your class group name for case match evaluation. For example: ServiceCaseClassGroups(<APPEND>).Name = "PegaCA-Work"
Configure the conditions on the case match rule. For more information on completing the case match rule, see Case Match form - Completing the Evaluation tab.